We usually look for ways to simplify what we're doing around here. We like reducing those five-step dances to a single tap and superfluous twirl. It reduces the chances for error, extends our productivity and makes us happy. It even gives us the illusion of living longer. Intercepting ⌘-E. We can't help Editing when we want to Export. But that's not the only way to play the game. And the other day we ran into a situation that called for an alternate approach. That's when we found ourselves making the same bonehead mistake we'd made a week earlier. We had finished editing our slide show images in Lightroom and were ready to export them. We use a ⌘-E shortcut to Save for the Web in Photoshop, so we thoughtlessly hit ⌘-E for export in Lightroom. But that's not Lightroom's keyboard shortcut for Export. Instead, it's the command for Editing in another application. And since we had about 20 full-resolution images selected for Export, we sent them all to Photoshop for editing. Which called for a coffee break. Maybe even lunch. We had to put an end to this, so we thought we'd just remap ⌘-E. Well, disable it, really. We didn't want to get into the habit of using it for Export in case we found ourselves working on a machine that did not have it disabled. That could be, well, embarrassing for an industry influencer. Lightroom, unlike Photoshop, does not allow you to remap (or disable) its keyboard shortcuts. And the keyboard System Preferences in macOS doesn't let you work with Lightroom's shortcuts either. The other day we found ourselves making the same bonehead mistake we'd made a week earlier. But Keyboard Maestro doesn't care about those silly conventions. It was happy to oblige. So we opened the Keyboard Maestro editor, created a new group active only in Lightroom and created a macro triggered by ⌘-E.
Now what should it do? Nothing, we thought at first. But no feedback at all can be, at certain times of the day, confusing. And while that would prevent us from sending 20 images to Photoshop, it would also prevent us from sending even one when we really wanted to send one. Turns out we didn't want to disable the command so much as confirm it. There isn't an obvious way to tell if you have just one image selected or more (which would have made a very clever semaphore), so we told Keyboard Maestro to look for an enabled Select None menu item to make sure something was selected and then put up a prompt to acknowledge our request, providing a button to Edit, another to Export and one to Cancel. You can see the prompt in the illustration above. The only catch was that we couldn't just send along a ⌘-E to Edit because that would bring up the confirmation prompt (whose job, after all, was to intercept ⌘-E) again. So we used Lightroom's menu command to edit the image in Photoshop. We have to confess our continuing astonishment at just how useful Keyboard Maestro has been. You don't have to be a coder to profit from it. You just need a problem. And who doesn't have a problem? 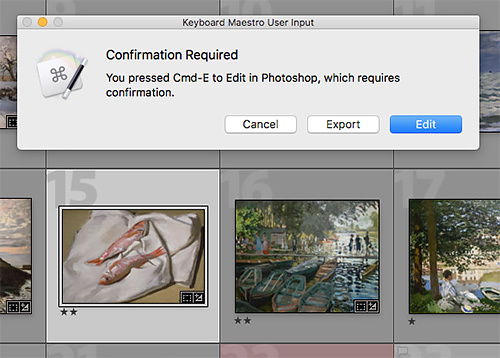 Our ⌘-E solution is just another excellent example of Keyboard Maestro's usefulness. It helped us automate away a common mistake, which, after all, is just another way of increasing our productivity.